Do you see my butterfly? Growing up, I always studied the sky. Clouds, stars, the tops of the trees, I loved to lie back, let the wind rush over my skin and slip through my hair, taking in a moment, letting my mind go, and drifting with whatever came into my sight. Life happens and we grow. We take on more responsibility. I forgot about the relaxation and the joy in many of these simple natural moments, trapped in the endless cycle of rushing, and thinking, and getting tasks done. I’ve recently discovered the wonders of studying the clouds again, and I’m learning the art, remembering what I loved about it so much growing up—I’m teaching my kids to love it, too. First, learning to quiet the mind is a difficult task. If I close my eyes longer than 10 seconds, I can’t hang on to a clean slate in my mind for long. Busyness slips in. Tasks slip in. But with the clouds, the sky, and the air all around you, it’s easier to let go, and to remind yourself as those thoughts try to wiggle back in, I don’t want to think about them now. I want a moment just for me. It’s a free way to relax and gain some balance. Breathing deeply is not something that comes easy when you’re stressed. In fact, it’s one of my first indications I’m feeling more stress than I should. 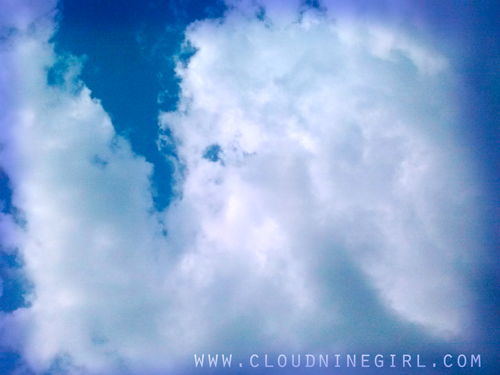 As I stare at the clouds, I concentrate and take longer deeper breaths. I feel the rise of my chest and I try to count 5 seconds as I inhale. I visualize the air rushing to the tips of toes and I make sure to press my shoulders away from my ears. If you’re a visual learner and an experiencer like me, the world around you is a perfect place to keep your mind in check. 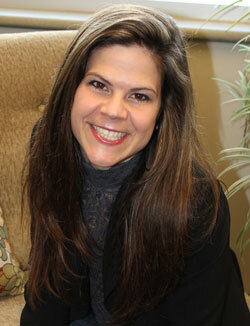 Then you can get your body back in check and approach your stress with a calmer and more refreshed perspective. Give your mind a new problem to solve. What do you see? When was the last time you saw an animal like that, or an object, and maybe you can backtrack to a great memory—one that makes you laugh or smile on the inside. I’m pulling this one directly from the article a read. 5. Clouds are a Moving Painting. If you like art, watch the clouds. They constantly create a canvas of shape, natural beauty, and color. The lighting will never be the same again in that exact second, the next day, or any time down the road you think you might try to study the sky. If you decide to try and watch the clouds, let me know how it goes. I’d love to hear what you saw and how you felt. How about my sweet elephant? 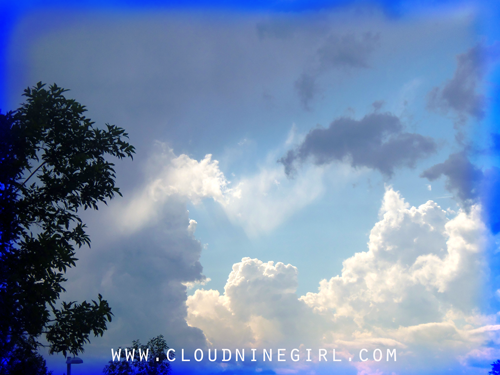 Posted on July 12, 2013, in appreciating beauty around you, cloud 9 girl, cloud nine girl, cloud watching, Erika Beebe, nature. Bookmark the permalink. Leave a comment.